Braincrew Apps came up with methods better integrated with Odoo than we were thinking of utilizing. Worked out very well and was good with updates and very responsive to requests for amendments. Very efficient and great communication . App delivered within full support of odoo mobile framework to my exact requests. Checks back requirenments to have the right joined understanding, good quality of programming, delivers always on time, flexible to adopt changes. Very happy with the delivery – thanks! The Proven has done an excellent job. The development was more complex than expected and they have worked hardly until everything was fine, demonstrating his skills and dedication. I will certainly work again with them. Braincrew Apps is very professional working in all projects large or small – delivered on time, flexible, good work & quality.. It is a very competitive world now and every business needs to automate their various operations to stay on top and brings value to the market. Odoo is a leading business suite that can connect operations of an organization like Sales, Marketing, Financial Management, Project Management, Manufacturing, CRM, E-Commerce etc. in a single application for an effective management and quality output. But, Odoo may not be 100% readily available software for your organization. This is where Braincrew Apps comes into the picture. Our expert team of consultants can mold Odoo to fit any type of businesses or develop the new requirements that can scale your company too high levels. Why you should use Odoo? Odoo community version is a fully open source software, that gives you full permission to customize it as per your business requirements. 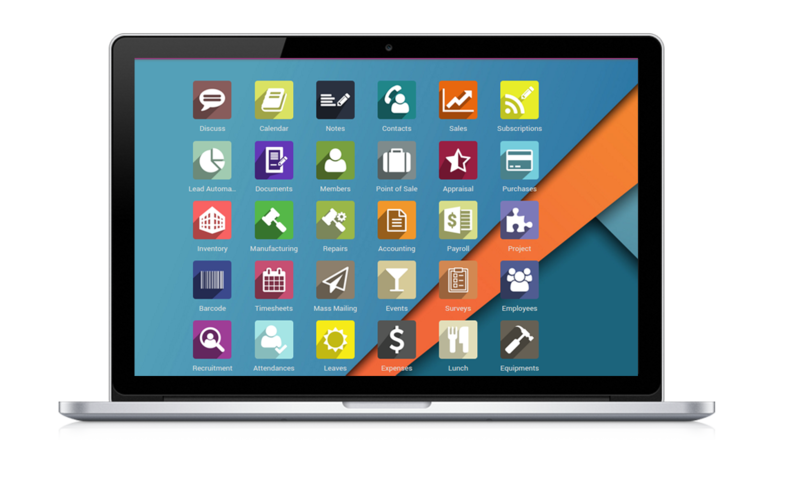 Odoo marketplace running with thousands of app and themes available for you to choose from. You can use these apps to enhance the capabilities of your Odoo setup. Odoo is a power-packed suite of business requirements that are ideal for SMEs or enterprise organizations to automate their workflows. Odoo’s modular approach allows you to customize any screen or processes to match your business requirements. No limits, No hassles! Just focus on productivity. Odoo is a huge ERP system that sometimes becomes difficult to understand how to structure it for your business implementation. Odoo implementation without proper guidance may lead back you to square one and cost your precious time and money. Braincrew Apps experienced consultants will carefully understand your business process and come up with the best possible implementation method to kick-start with Odoo benefits for your organization. Odoo is running with a flexible and modular approach that allows you to customize anything you want. Braincrew Apps come to a full understanding of the requirements, analyze them in an Odoo way, and then come up with a plan and solution to fulfill them. Needless to say, we can super easily customize any default or third party Odoo modules and processes for your requirements. Braincrew Apps running with the experienced pool of developers that are aware of each and every aspect of Odoo software. We offer development of new modules or themes from scratch when the default modules of Odoo are not capable or appropriate to fulfilling your needs. Braincrew Apps is available to continuously monitor your setup to make sure it’s always available for your organization or end users. We ensure to provide complete end-to-end support, maintenance & training services for your Odoo environment and act immediately if any sudden hazy situation occurs. This approach will be best suited when you are prepared with specifications/features needed for your requirement. You can provide us with complete details and our consultants will provide you a fixed cost with the targeted deadline to complete the job. If you are not sure about your requirement at the initial level, you should go ahead with this model. You can start with 40 hours bucket and later “pay as you need” basis to complete the remaining part. You will be assigned an account to track the project progress. This is the most flexible and effective approach to save about 60% of the development cost associated with your project. You will have resources only work for you to give full control over your team and keep yourself updated on the project status.